In a Forensic Case File a few weeks ago, we talked about how a French scientist concluded in 2007 that the remains discovered in Paris in 1867 were not those of Joan of Arc. One of the tools he used to determine that the remains were actually those of a 1400-year-old mummy was C-14 analysis, more commonly known as ‘carbon dating’. But what is carbon dating, and how can we use it to measure the age of historic samples? Carbon is one of the six major building blocks of life, along with nitrogen, oxygen, hydrogen, phosphorus and sulfur. But all carbon is not created equal. Nearly 99% of elemental carbon is carbon-12 (C-12), which means that the carbon atom contains 6 protons and 6 neutrons. 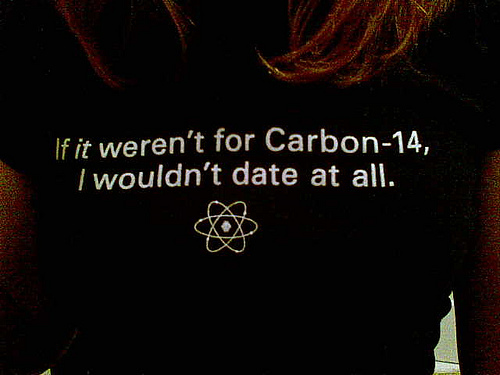 But there are several alternate forms of carbon; it is C-14 (a carbon atom containing 6 protons and 8 neutrons) that is crucial in carbon dating. The most available source of carbon for living things is through the atmosphere. Plants respire, taking in CO2 and using that carbon to grow. When we eat plants (or eat other animals that eat plants), those building blocks are transferred to us. As long as we continue to eat, fresh carbon gets built into our bodies. But the moment we die, we stop taking in new carbon and that’s when the C-14 clock starts ticking as it slowly starts to break down. C-12 is stable form of carbon, but C-14 is unstable and ultimately breaks down into nitrogen and hydrogen. Using C-14's known half-life of 5,730 years, scientists can calculate when the organism being tested died. To do this, a small amount of organic sample (bone, wood, shell, peat etc.) is pulverized and burned, producing CO2 containing a mix of both C-12 and C-14. When the sample C-12/C-14 ratio is compared to the current atmospheric C-12/C-14 ratio, scientists can estimate the age of the sample. In the case of Dr. Philippe Charlier, he was able to determine that his remains were too old to possibly be those of Joan of Arc. Carbon dating is a valuable tool for discriminating archeological samples from potential forensic discoveries. It has been used to date remains discovered at construction sites, confirming that a modern forensic investigation is not required, and allowing the remains to be returned for proper reburial to the Native American tribes originally populating the area of discovery.